Analysis: Where are We Going – on a Dead-End Route? You are at:Home»Governance & Unity News»Governance & Unity Essays»Analysis: Where are We Going – on a Dead-End Route? After all of the astonishing revelations The National Herald has made about the Archdiocese’s dire financial situation, the crucial question on the minds of thousands of Greek-Americans throughout the United States is: where are we going as an Archdiocese and a community in general? Those who are in charge at the Archdiocese – along with Archbishop Demetrios, who is at the top – are trying to capitulate with spin and propaganda, using as tactics slogans that all is well and good. The patriarch feels sorrow and concern for what is happening. And now the Archdiocese faces the extreme situation of having to try to obtain a $10 million bank loan to repay its debts. Moreover, it has failed on the national and international stage in its attempt to build the St. Nicholas National Shrine at the World Trade Center. With all due respect to the patriarch, we state here painfully that he is greatly responsible for the unacceptable and embarrassing deterioration of the Greek Orthodox Archdiocese situated in the world’s foremost superpower. 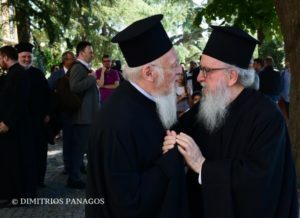 The patriarch is trying to justify the unjustifiable in attempting to make sense of Demetrios’ recent attempts to misguide the Patriarchal Synod regarding the loan. I am of the opinion that as long as the dollars flow into the coffers of the Archdiocese and metropolises, so that the Church “employees” of all ranks – archbishop, metropolitans, auxiliary bishops, chancellors – can continue to lead a lavish lifestyle, nothing will change. If, someday, the dollars stop flowing, then change will begin. I am not suggesting ceasing to support the parishes, but the faithful deserve detailed financial reports and full accountability. Enough with the hypocritical misleading statements that no one knew what was going on with the finances. Let us be clear and direct by calling what happened what it was: corruption. Yet again, it is the People of God who will pay through the monthly “taxation,” which was christened a “stewardship” for the sustenance of the myth called “ministries,” which were started under Archbishop Iakovos and continue to this day. We seem unsuspicious that these “ministries” are in place simply to sustain their managers and employees. How do these so-called ministries affect parishioners’ lives? How? During Demetrios’ 19-year tenure, the Archdiocesan annual budget more than doubled, from $13 to $30 million. How and where has all this money been spent, and how has it changed the quality of life of the Archdiocese and the parishes? Here’s how the game is played: the Archdiocese puts pressure on the metropolitans, who bully priests and parish councils, who in turn constantly press congregants to give more and more money. It is a fact that many of our communities are having financial difficulties. People have grown tired, and that was evidenced again this year during the election period, when there was difficulty finding parish council candidates. I know this firsthand in New England, because that is where I live, and I have personally seen and experienced the deterioration of ecclesiastical life. Even big parishes couldn’t have elections for lack of candidates, and in most instances the same old and tired persons were recycled just to say the parish has a council. The fanfare about “emerging leaders” and “Orthodoxy on tap” has been proven to be just another myth. I am stating as firmly as possible that the metropolitans and many of the priests are responsible for the alienation of the people. We have very good people in our community and parishes, but they are disheartened by the behavior of some hierarchs and priests, and so they leave. In fact, some of these clergy chase good parishioners away with bullying tactics. Younger and well-educated parishioners don’t even want to associate with some hierarchs and priests. This is the bitter reality. In these murky conditions, the future seems foggy as well. If there was a Superior Ecclesiastical Leadership, clearly, I mean, on the patriarchal level, Demetrios and some metropolitans would have gone home years ago. But now, where can someone place hope? Whom should we trust? And so, the Church’s drama and deterioration continue. Although Mr. Kalmoukos does a pretty good job in reporting the news, his analyses are quite narrow; our community’s issues (problems?) require a deeper sociological view of what is happening in today’s word. Just looking things in a single line connecting new York with Istanbul does not do justice to the wider elements affecting our parishes in this country. However, he is right in placing the responsibility on the hierarchy, especially those living comfortably in Turkey at the expense of Greece and the Greek diaspora, mostly the naive Orthodox in the USA. As poorly as I write, I can not believe this article was included in the rag know as the National Herald. The grammar and syntax are juvenile at best. Mr K. has an axe to grind the NH is the vehicle to express his views. I am surprised that he continues to receive “inside information” from “leakers” among the clergy and especially the Bishops. Obviously, there are problems at the Archdiocese but cutting funds is not the answer. If the Church is our mother, as our theology teaches, how many of us would cut funding to our mother if she were in need. Besides, those who stop giving will not be recovered and many who claim they have stopped giving because of the problems in the Archdiocese or even the local parish never gave in the first place. Most members of the GOA are not faithful stewards, and if they were, festivals would not be needed to support parishes. The Church should not be in the restaurant business. The GOA needs to first become totally financially transparent both on the local, diocesan and national level. Secondly, the simple principle of a sincere apology should be followed: remorse, responsibility and remedy. It seems to me that only one part of the equation has been followed–the remedy. I firmly believe new procedures have been put into place and the remedy is in process. But who has taken responsibility and shown the proper remorse. Without these 2 steps healing will not occur. My family gives at a rate of double the average pledge in our parish. We will continue to give but we did not sign a pledge this year. People who give are aware and are not happy. 20 percent of every dollar we give goes to support these dishonest men who stole money from the sacred ground in New York. If we could find a we to give to our parish only we would. you CAN give to your parish only, by supporting its programs such as Philoptochos directly, or funding specific projects – that is what we do now. We also did not sign a pledge card — It’s time for them to wake up and suffer the consequences of their dishonesty.